The market for thermal transfer label is catering to diverse application sectors, ranging from healthcare and transportation to retail and electronics, and feeding off the prosperity of each of them. Consequently, the demand in the global thermal transfer label market is projected to expand at a substantial CAGR of 5.5% during the forecast period of 2017 to 2022. The future of the thermal transfer label market is also dependent on innovation, as there are vast possibilities of its application for simple to complex tracking of products, individuals, and payment transfers. The thermal transfer labels are adoptable to irregular and curved surfaces, offer resilience against wear and tear, and vastly improve the efficiency of tracking in busy environments such as airports, hospitals, and retail shops. As far as revenue is concerned, the global thermal transfer label market has been estimated to be worth US$3,003.3 mn by 2022, up from its evaluated valuation of US$2,296.6 mn in 2017. Based on material, the global thermal transfer label market has been segmented into paper, polyester, polypropylene (PP), and polyethylene (PE). In 2017, paper segment accounted for 36.7% of the total demand in the thermal transfer label market across the world, generating a revenue of US$843.7 mn. During the forecast period of 2017 to 2022, the demand for paper thermal transfer label is anticipated to increase at a CAGR of 7.5%, which is much higher than the other three segments. Paper labels can withstand environmental conditions such as heat and sunlight, offer high quality printing and unlimited flexibility, and moderate durability. These labels are available in a variety of sizes to meet the requirement. By the end of 2022, the paper segment of thermal transfer label market has been estimated to be worth US$1,209.3 mn, which will reflect 40.3% of the overall demand. This segment is growing at 73.1 mn annually over the course of the forecast period. On the basis of printer type, the global market for thermal transfer label has been bifurcated into desktop, industrial, and mobile, whereas application-wise, the market has been categorized into healthcare, tracking, logistics, and transportation, industrial goods and products, retail, semiconductor and electronics, and others. Geographically, apart from a dedicated chapter on the country of Japan, the report takes stock of the potential of the thermal transfer label market in the regions of North America, Europe, Latin America, Asia Pacific except Japan (APEJ), and the Middle East and Africa (MEA). During the forecast of the forecast period of 2017 to 2022, the APEJ region is projected for the best CAGR among all regions, i.e. 6.9%. This region is estimated to produce a demand for thermal transfer label worth of US$293.2 mn between 2017 and 2022. North America is another highly profitable region, though the progress rate is lot slower than that of APEJ. Expanding the demand at 4.3% during the said forecast period, the North America thermal transfer label market is evaluated to be worth US$616.9 mn by 2022, significantly up from its valuation of US$499.4 mn in 2017. The Europe thermal transfer label market is expanding at a CAGR of 4.9% and promises to present a demand worth of US$754.3 mn, whereas the revenue from MEA thermal transfer label market is anticipated to increase at a CAGR of 4.9% over 2017-2022, to reach US$ 176.7 mn by 2022. Honeywell International Inc., Henkel AG & Co. KGaA, CCL Industries Inc., 3M Company, Constantia Flexibles Group GmbH, LINTEC Corporation, Inland Label and Marketing Services LLC, WS Packaging Group, Inc., Multi-Color Corporation, and Coveris Holdings S.A. are some of the key players venturing in the global thermal transfer label market. The market for thermal transfer label is expanding steadily and is promising a fruitful future owing to its diverse applications. During the forecast period of 2017 to 2022, this report on the global thermal transfer label market analyzes all factors that may favor or restrain the demand, evaluates and estimates the valuations of each segment, picks out highly profitable regions and countries, and profiles some of the key companies in order to represent the competitive landscape. This report has been developed by professional market research analysts and aspires to serve as a credible business tool for its targeted audiences such as the manufacturers of thermal transfer labels, importers and exporters, traders, distributors, and suppliers of these labels, and end users. This TMR report evaluates and forecasts the thermal transfer label market on the global, regional, and country levels. The study provides forecast between 2017 and 2022 with 2016 as the base year. The report includes a comprehensive value chain analysis for each of the application segments. It provides a comprehensive view of the market. Value chain analysis also offers detailed information about value addition at each stage. 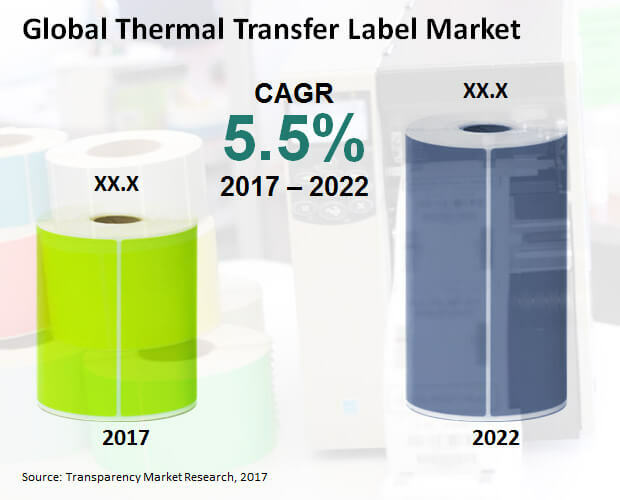 The study includes drivers and restraints for the thermal transfer label market along with their impact on demand during the forecast period. The study also provides key market indicators affecting the growth of the market. The report analyzes opportunities in the thermal transfer label market on the global and regional level. Drivers, restraints, and opportunities mentioned in the report are justified through quantitative and qualitative data. These have been verified through primary and secondary resources. Aspiring to cater to an esteemed group of audiences, the report contains a qualitative write-up on market attractiveness analysis, wherein applications and countries have been analyzed based on attractiveness for each region. Market size, growth rate, raw material availability, impact strength, profit margin, technology, intensity of competition, and other factors including environmental and legal have been taken into consideration by the report in order to derive the general attractiveness of the market. The report comprises price trend analysis for textile coatings between 2017 and 2022. Secondary research sources that were typically referred to include, but were not limited to company websites, financial reports, annual reports, investor presentations, broker reports, and SEC filings. Other sources such as internal and external proprietary databases, statistical databases and market reports, news articles, national government documents, and webcasts specific to companies operating in the market have also been referred for the report. In-depth interviews and discussions with a wide range of key opinion leaders and industry participants were conducted to compile this research report. Material-wise, the global thermal transfer label market has been segmented into paper, polyester, polypropylene (PP), polyethylene (PE), and others. On the basis of printer type, the global market for thermal transfer label has been bifurcated into desktop, industrial, and mobile, whereas application-wise, the market has been categorized into tracking, logistics, and transportation, healthcare, industrial goods and products, semiconductor and electronics, retail, and others. Geographically, the report takes stock of the potential of thermal transfer label market in the regions of Asia Pacific except Japan (APEJ), North America, Europe, Latin America, and the Middle East and Africa (MEA). For each of the regions, the report picks out key countries and provides individual revenue comparison in terms of material, printer type, and application sector. Honeywell International Inc., 3M Company, CCL Industries Inc., Constantia Flexibles Group GmbH, Henkel AG & Co. KGaA, LINTEC Corporation, Inland Label and Marketing Services LLC, WS Packaging Group, Inc., Coveris Holdings S.A., and Multi-Color Corporation are a few prominent companies currently occupying healthy spots in the global thermal transfer label market.